This holiday is all about pink, whether it is learning about it, wearing it, eating it, drinking it, driving in it, laying on the beach with it, carrying it, covering up with it or etc. it is just all about pink. So, think pink and celebrate as it is National Pink Day. This day is celebrated each year on June 23. First used as a color name in the late 17th century, pink as a pale red color which got its name from a flower of same name. 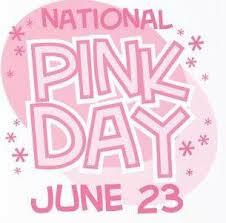 So remember wherever your heading today make sure to wear something pink!! Happy National Pink Day to you!